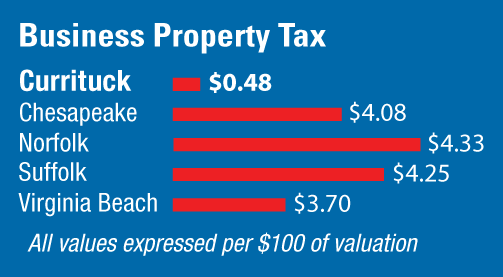 Because Currituck County is fully unincorporated, all personal, business and real property is assessed at the same low rate of only 48 cents per $100 of valuation. Businesses pay twice the real estate tax and up to eight times the business property tax. For 2017, North Carolina’s corporate tax rates will drop to three percent – lower than Virginia – along with a lower, flat tax for personal income. By far the lowest tax burden imposed in the region, taxes in Currituck County provide and excellent incentive for new, expanding or relocating businesses. Veterans who reside in North Carolina realize an additional tax benefit as some military pensions are not taxed in this state. All domestic corporations (those chartered in North Carolina) and all foreign corporations which are doing business in North Carolina are subject to income tax and are required to file annual income tax returns, except corporations specifically exempt from the tax under G.S. 105-130.11, and S corporations exempt under G.S. 105-131. Every person engaged in the business of selling tangible personal property at retail, renting or leasing taxable tangible personal property in this State, operating a laundry, dry cleaning plant or similar business, or operating a hotel, motel or similar business in this State must register with the Department of Revenue and obtain a Merchants Certificate of Registration. A merchant must file a return for each reporting period showing gross sales, receipts, purchases, and the sum of all exempt sales or receipts which are not included in the computation of tax due. Certain taxes must be withheld from employee wages and remitted to the appropriate government agency. These include state and federal income taxes and FICA (Social Security). The State of North Carolina requires that every new employer complete and file with the North Carolina Department of Revenue an application for a North Carolina withholding identification number. In addition, the federal government requires that every employer who pays wages to one or more employees file an application for an employer identification number with the Internal Revenue Service. You may hear these numbers often referred to as Tax ID Number or Taxpayer ID Number. Employer's Tax Guide (Publication 15). For more information regarding Federal Employer Identification Numbers, read Understanding Your EIN (Publication 1635). pays $1,500 in wages during a calendar quarter. You may also obtain general information provided by ESC from a Business License Information Office License Consultant.